Part 28 of the Harvesting Justice series. The Honduran-owned and foreign-financed company has been attempting to build a dam on the sacred Gualcarque River in the Lenca community of Rio Blanco. Community members have blockaded the road against the company, thwarting the dam’s construction, for over five months. The charges brought against the three indigenous rights defenders are part of a strategy of physical, legal, and political suppression by the Honduran government and industries to break indigenous resistance to mining, damming, logging, and drilling. The exploitation of indigenous lands, and the riches upon them, are being imposed without the communities’ consent. This is in violation of the Honduran constitution and of Convention 169 of the International Labor Organization which requires free, prior, and informed consent by indigenous peoples before anything can be built on, or taken from, their lands. Indigenous communities that are part of COPINH alone have well over a dozen extraction concessions upon them. Dozens more are advancing throughout the country. All were approved by laws passed by an unconstitutional congress that was voted in under an illegal government that took power in a 2009 coup d’etat. The US government was firmly behind the coup. Beyond plunder of their territories, the physical, legal, and political attacks on COPINH members and other indigenous peoples in Honduras have been increasing rapidly. Assassinations, kidnapping, machete slashing, arrests, and threats are weekly events in the communities which are resisting. Just yesterday, September 5, at 3:00 in the morning, police stormed the home of Desiderio Méndez and his family. They threatened Desiderio with torture and then took him away. For several years, the community has repeatedly rejected the dam project in town hall meetings and community assemblies, protested against it, and filed complaints with government agencies. 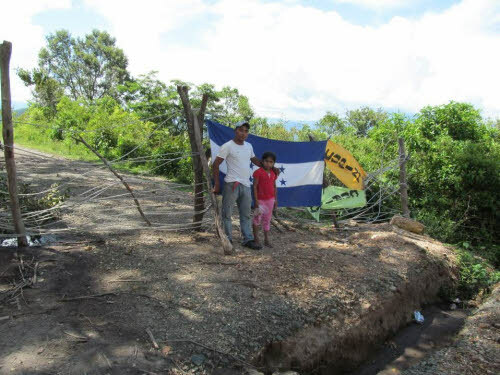 So several days later, on April 1, the people of Rio Blanco began physically blocking construction of the dam, and they have been blocking it ever since. Like the dam, the access road is in their ancestral territory, surrounded by the fields and lush forests that the Lenca have carefully stewarded for hundreds of years. Community members show up, day in and day out, in the rain, in the heat, with or without food, to defend their territory. On May 17, the zone was militarized and soldiers began intimidating and threatening community members. The US-funded soldiers eat, sleep, and live at the dam company’s installations. Berta Caceres of COPINH noted that they “have turned it into a military base” as they serve the interests of the dam companies. As COPINH leaders face prison time for their defense of Rio Blanco, one might ask: who should really be on trial in Rio Blanco? Who has really usurped the land and caused damages? The community’s resistance continues, despite having been evicted several times, despite the continual violence, and despite the men in ski masks who lurked outside the homes of community leaders. As the struggle over control of Rio Blanco continues, please add your voice to the Lenca’s request for international support. Join a protest outside a Honduran embassy or consulate near you on September 10, an international day of action to demand that 1) the charges against Berta, Tomás, Aureliano, and all others defending their lands be dropped, 2) the dam concession in Rio Blanco be cancelled and the project stopped, 3) ancestral territories be respected, and 4) the violence against indigenous communities stop. Click here to see if there is an action in your town, and if not, consider planning one. Send an e-mail to the Honduran government urging them to stop the judicial persecution of COPINH and to US officials urging them to end military aid to the Battalion stationed in Rio Blanco. Call the Honduran authorities on September 10 and urge them to stop the criminalization of COPINH. 1. Huenchuán Navarro, Sandra. “Territorial Impacts of Economic Globalization in Latin American and Caribbean Indigenous Territories.” Statement presented in the XXII Latin American Congress of Sociology of the Latin American Sociology Association (ALAS). University of Concepción, Concepción, Chile, 1999. You can order Harvesting Justice and find action items, resources, and a popular education curriculum on the Harvesting Justice website. Harvesting Justice was created for the US Food Sovereignty Alliance, check out their work here. Good to see the people of Rio Blanco standing up to another massive corporation that seeks to destroy the ecosystem and their way of life.